The side-address Audio-Technica AT4050ST Stereo Condenser Microphone is externally polarized (DC bias). Its independent cardioid and figure-eight elements are configured in a mid-side arrangement with switch-selectable internal matrixing. Select from either a left-right stereo output (wide 127 or narrow 90) via the microphone's internal matrixing system, or choose discrete mid-side signals for later manipulation. 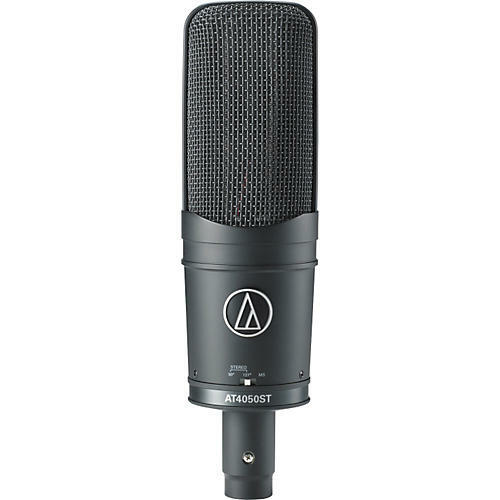 The Audio-Technica 4050ST mic is designed to meet the most critical acoustic requirements of professional recording, broadcast and sound reinforcement. The AT4050ST microphone includes a 5.0m (16.5') dual output cable terminating in a 5-pin XLRF-type to 2 standard 3-pin XLRM-type connectors. The microphone output is a 5-pin XLRM-type connector. The AT4050ST microphone is equipped with a switchable 10 dB pad and a switch selects flat response or low-frequency roll-off (via integral 80Hz high-pass filter). Audio-Technica encloses the AT4050 microphone in a rugged housing. The included AT8449 shock mount provides superior isolation and permits mounting on any microphone stand with 5/8"-27 threads. A dust cover and a protective carrying case are also included. The AT4050ST requires 48V phantom power on pins 2 and 3 of both XLR3M-type connectors for operation. Wiring must be balanced throughout, and all mic cables in the system must be wired consistently: pin 1-to-pin 1, etc. If connecting to unbalanced inputs, good-quality balanced line transformers must be used. Mid-Side Operation: In M-S mode, the microphone provides independent Mid and Side signals. This allows the width of the stereo image to be adjusted in post production or in the field with a matrix mixer. Matrixed Stereo: The microphone offers two internally matrixed modes which provide traditional "left-right" stereo without the need for external mixers. To accommodate varying acoustic environments, the user may select between a wide pattern (127) with increased ambient pickup, and a narrow pattern (90) which offers more rejection and less ambience. Output phase is "Pin 2 hot." For correct left-right stereo orientation, position the microphone so the raised Audio-Technica emblem is facing the sound source. In the internally matrixed modes, locating the microphone nearer the sound source enhances the apparent width of the stereo image, while decreasing room ambience. Moving away from the sound source will result in a narrower stereo image and more room sound.